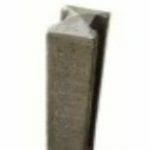 All the slotted concrete fence posts featured on this page are available from stock with delivery in 2-5 working days. with the exception of the heavy duty posts; these are not a stock item and delivery/collection 5-10 working days. If you are looking for slotted concrete fence post suppliers you have landed in the right place. Here at Oakdale we have a wide range of slotted concrete fence posts to suit all styles of fence panels. Because we carry extensive stocks, year round, we are able to offer the very best prices on these posts. Our concrete fence posts can be used with any of the traditional or modern fencing panels . You can use these posts to mount picket panels , feather edge, larch lap or modern decorative panels. These fence posts can be installed as supplied or you could add a decorative touch by painting the posts with masonry paint. We supply two types of slotted fence post – medium duty and heavy duty. Our medium duty post is our base level model. These post are reinforced and are a 4 inch x 4 inch cross-section. 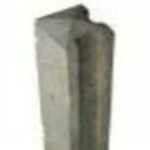 Our medium duty concrete fence posts are available in 5ft, 6ft, 7ft, 8ft and 9ft variants in the intermediate style. Ends and two way corners include 10ft, 11ft and 12ft variants for structural strength at ends and changes of direction. You will need to allow 2ft in the ground when choosing the correct length of post. Our top of the range heavy duty slotted concrete fence posts come with larger reinforcing bars, a denser concrete mix and a thicker cross-section (5 inch x 5 inch). These posts are built to last. We supply intermediate and end posts in this range that run from 5ft through to 12ft lengths.